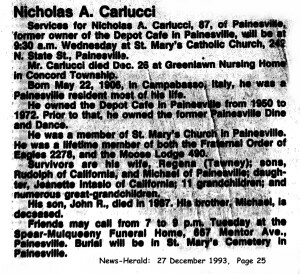 Nicola Carlucci first appears in the Painesville, Ohio, area in 1940 when he appears in the 1940 Federal Census. 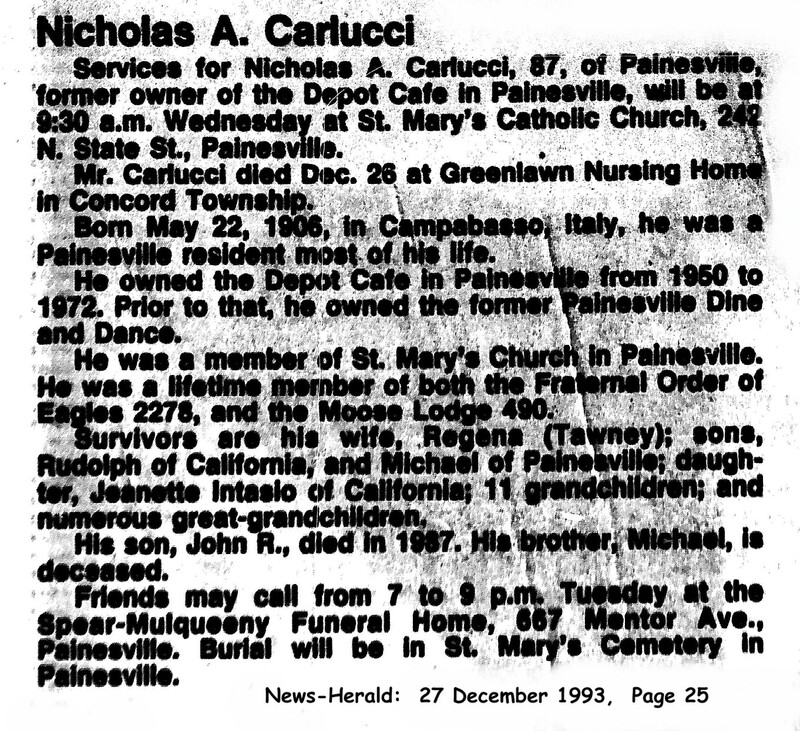 His common name in the United States was Nicholas A. Carlucci. Nicola Carlucci, son of Giovanni Carlucci and Carmella Arcaro, was born on May 22, 1906, at Sant’Angelo in Grotte, Italy. He first married Caroline M. Notte, daughter of Michele Notte and Filomena Zappitelli. He married second, Regina Tawneyk. Nicola died on December 15, 1993, at Greenlawn Nursing Home, Concord Township, Lake County, Ohio, at age 87. His body was interred at St. Mary Cemetery at Painesville Township, Lake County, Ohio. Nicola moved to Painesville in the 1930’s, moving from Conneaut, Ohio. He was owned Depot Cafe from 1950 to 1972. Previously, he owned Painesville Dine and Dance in Painesville Township. 1. Michael Carlucci. Birth date not known. 2. John R. Carlucci was born on April 21, 1927, at Conneaut, Ashtabula County, Ohio. John died on January 17, 1987, at Painesville, Lake County, Ohio, at age 59. His body was interred at St. Mary Cemetery at Painesville Township, Lake County, Ohio. 3. 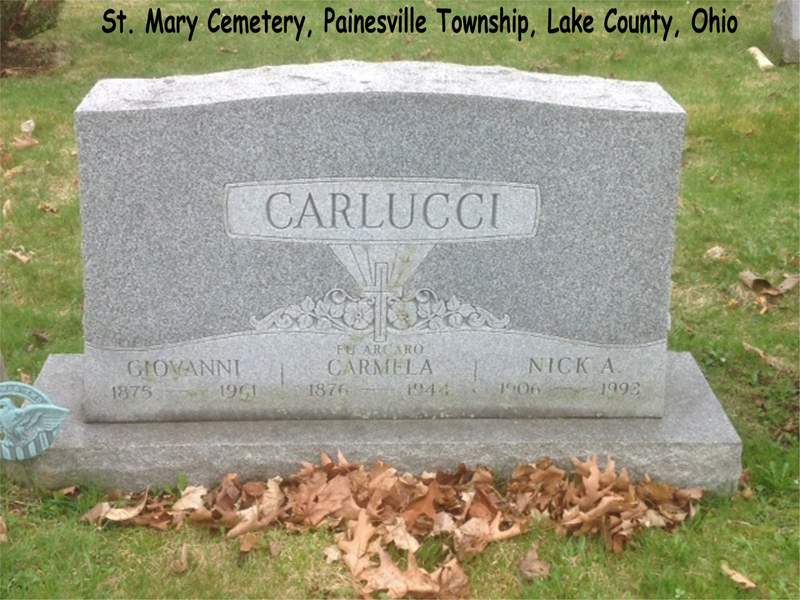 Rudolph J. Carlucci was born on April 19, 1928, at Conneaut, Ashtabula County, Ohio. He married Rosemary J. Fiochetti, daughter of Alberto Fiocchetti and Emilia Elana Izzi, on July 12, 152, at Lake County, Ohio. Rudolph died on September 10, 2007, at Painesville, Lake County, Ohio, at age 79. His body was interred at Riverside Cemetery at Painesville, Lake County, Ohio. 4. Jeanette Carlucci was born about 1933, at Ohio. She married Ron Inteso, son of Harry Inteso and Tillie Wilkins, on May 23, 1953 at Cuyahoga County, Ohio.